CarGurus has 36,535 nationwide Colorado listings starting at $1,799. The Chevrolet Colorado compact pickup replaced the S-10 back in 2004, and together with its GMC Canyon sibling, it was last redesigned for the 2015 model year. While nothing revolutionary is in the works for 2017, it does get some notable changes—some new colors and appearance packages, a more powerful and efficient V6 engine, and a standard 8-speed transmission. New paint colors for the 2017 Colorado include Graphite Metallic, Cajun Red Tintcoat, Laser Blue, and Orange Burst Metallic to replace Red Rock Metallic and Inferno Orange Metallic. A new Custom Special Edition for the Work Truck trim level is also available, with body-color door handles, grille, and rear bumper as well as special 18-inch alloy wheels. An optional new low-gloss Black Stripe package adds stripes to the hood and tailgate, and the Teen Driver system, which debuted with the 2016 Chevrolet Malibu, is now standard on all 2017 Colorados. The Teen Driver system lets parents add a PIN to set limits on speed, disable the audio system until seatbelts are fastened, and keep all safety technology engaged. The Colorado’s new 3.6-liter V6 engine makes 308 hp and 275 lb-ft of torque (a slight bump over last year’s engine), features cylinder deactivation, and is paired exclusively with a new 8-speed automatic transmission. While it has the same displacement as the V6 it replaces and offers only a moderate increase in performance, it’s a completely different unit that shares similarities with the Cadillac ATS, Chevrolet Camaro, and Buick LaCrosse engines. Fuel-economy figures are 17 mpg city, 24 highway, and 19 combined, slightly worse than the old V6. 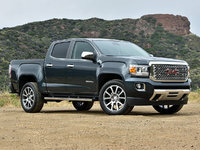 Other engine choices include the 2.5-liter inline 4-cylinder (I4) engine and the 2.8-liter Duramax turbodiesel engine, both of which are still mated to a 6-speed automatic transmission. For those hauling light loads with no major towing needs, the I4 is the most frugal option. It gets fuel-economy numbers of 20, 26, and 22 with rear-wheel drive (RWD) and 19, 24, and 21 with 4-wheel drive (4WD), but with just 200 hp and 191 lb-ft on tap, it’s not exactly a brisk performer. The turbodiesel can handle a lot more—thanks to its 181 hp and 369 lb-ft, it can tow up to 7,700 pounds. Fuel-economy estimates for the turbodiesel are 22, 30, and 25 with RWD and 20, 28, and 23 with 4WD. Teen Driver mode and a 4WD selector knob for 4WD trucks are now standard on the Colorado, but otherwise its cabin remains largely the same. The Colorado is available as an extended cab with a 6-foot bed or a crew cab with a 5- or 6-foot bed, and it offers ample head- and legroom and numerous small storage trays and bins. The rear seats aren’t as spacious as they look from the outside, but adults should be comfortable enough on relatively short drives. The bed includes 17 tie-down spots and can be customized with add-on features like a tonneau cover, a toolbox, and cargo dividers. 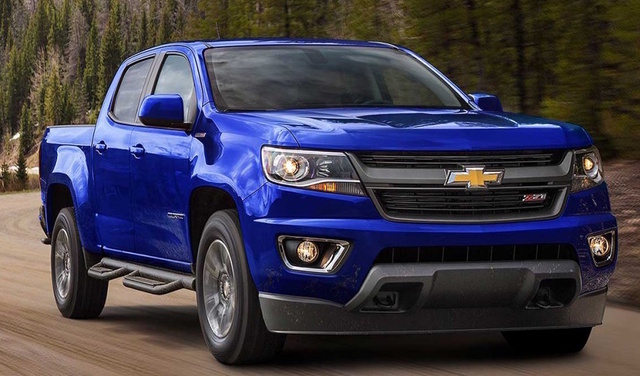 The Colorado comes in WT, LT, and Z71 trims with a choice of engine and cab. Even the base WT trim gets a USB port and 4.2-inch touchscreen, but the upholstery is vinyl, and there aren’t many convenience features other than the expected power windows and air conditioning. The LT trim level adds cruise control, cloth seats, an 8-inch infotainment screen, OnStar services, and a 4G LTE hotspot. Optional items for the LT include heated front seats, leather upholstery, a Bose audio system, auto-dimming mirrors, and navigation. The Z71 is both the luxury and off-road trim, and it comes with a locking differential, all-terrain tires, and hill-descent control. In National Highway and Traffic Safety Administration (NHTSA) crash testing, the Colorado got 4 stars overall. Standard safety equipment includes a reversing camera with dynamic gridlines, trailer-sway control, and hill-start assist. Lane-departure and forward-collision warning systems are optional, but automatic emergency braking is not an available feature. Teen Driver, which has finally made its way to the Colorado, allows parents to set driving parameters for specific key fobs to track some driving behaviors and limit others. What's your take on the 2017 Chevrolet Colorado? Users ranked 2017 Chevrolet Colorado against other cars which they drove/owned. Each ranking was based on 9 categories. Here is the summary of top rankings. Have you driven a 2017 Chevrolet Colorado? Can I put a 265/70 R 17 winter tire on my truck that has a factory size 255/65 R17?